Here’s a picture of my dog Jaxon loving your tripe. He is a super house dog, and he has never once gotten into the garbage for any reason in his life. He has plenty of other mischievous behaviors, but he’s perfect on house manners. 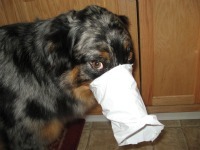 One day I heard a funny sound, and I walked into the kitchen to find his face stuck inside an empty tripe sleeve. He had finally, at 4.5 years old, found a reason to get into the garbage. He was a good boy to “stay” while I ran to get the camera. Thought you’d enjoy seeing how much Jaxon enjoys the tripe.